I'm about bite the bullet and build a board with a 208 TQFP chip in the center. I'm pretty nervous about messing it up, though I just overnighted an Air Pick ZT-3 to help me (should have known it would be waaaay too big for tweezers). I'm getting pretty good at dropping it on a bare board, but I would hate to have pasted the whole thing only to really munge it up so badly that I have to wipe clean the paste (inevitably taking some nearby pads along with it). What I'd like to do is align, lay down just the TQFP chip's solder and place that part before I do anything else. Then once that's in place, lay down solder for the rest of the board (or even in sections). The danger is that as the dispenser makes its way along the board, it won't lift up high enough to clear the already-placed chip. 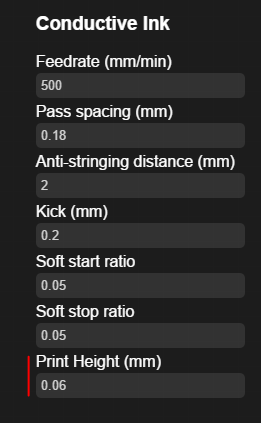 I see some settings in the software, would tweaking one of those help? Kick? Pass spacing? Probe pitch? I know this would slow things down, but better that than having to face potentially starting a complex board all over again because I couldn't remove failed paste (remember this is milled---there are slight grooves between the traces and pads). Dispense on the remaining pads, but avoid going over the chip to prevent damage to nozzle/chip. Unfortunately, the are no parameters in the settings menu that control the raise height. However, your use case is perfectly valid, so we'll have to discuss internally how to solve this for everyone. In the meantime, did you try doing a selective print? I believe this can be accomplished by doing 4 separate prints back to back. Highlight & dispense all pads on the right. Imagine wrapping a rubber band around the pads that you have selected, if the TFQP lies outside the rubber band outline, then you should be safe to dispense. When the carriage advances to dispense, it will always move in the XY first and then lower in Z, so it should jump over the TQFP. Yes, that's exactly right. I also use eyelets a lot for vias, which stick up about 1.5mm off the board when it's clamped to the bed, so it would be nice to know that those will be in the clear as well. I did the technique you described, but for different reasons. I didn't trust that the unit wouldn't still slam into the chip, and I couldn't afford that risk. I'm down to my last nozzle, and breaking it this weekend was not an option. So I waited until the end to place everything. I pasted the 0.5mm pads first to ensure they were cleanly laid down, then did the rest of the board in sections (about 100 parts). Which brings me to another problem: on large numbers of pads, I found that the paste output would progressively weaken. I would often have go back a few steps (to force the V1 to re-home the nozzle) and re-prime the syringe, making sure to dump out a fair amount of paste. I'd then be back to having to recalibrate the output a few times before continuing. This is much more of a problem when you have to wipe it down with other pads nearby that already have paste, since getting paste up is not as easy as ink. Sometimes if I was lucky I could squeak by with increasing the flow rate in the GUI, especially once I was on to the larger pads. Though I know I'm pushing the limits with 0.5mm pads, I found that calibration was particularly tricky there. With larger pads the nozzle can afford to mess up a swipe or two. Not so with the small pads, as there's only one swipe. And that's where you really feel the pain of the diminishing output. For the 208 TQFP I ended up doing one side at a time, cursing when I'd have to thoroughly wipe then start the row again just because the last 10-15 pads were too thin to be reliably reflowed. Keep in mind this was a new nozzle (I discovered the hard way that if it's even a little bent, it's toast), and I thoroughly flushed paste through it. So I don't know what what up with that. I did manage to successfully lay down all the pads with some patience. Thanks again for you and your team's responsiveness. I would often have go back a few steps (to force the V1 to re-home the nozzle) and re-prime the syringe, making sure to dump out a fair amount of paste. I'd then be back to having to recalibrate the output a few times before continuing. What CAD tool do you use? Doing this is just a matter of including vias in the GTP file. In EAGLE this is very easy to do - you just add the via layer along with the tcream layer. I'm not sure about Altium or Kicad, maybe others community members can help out here? I found that I could increase the flow number ad infinitum yet I would still end up with failed pads---I'd even have some extra paste coming out the nozzle as it approached the pad but it still wouldn't feed smoothly (I got up to 550 in Advanced Mode with no luck). The only way I could get it back to flowing freely was to re-prime. And since repriming involves taking the dispenser off the carriage, I needed to go back far enough in step-by-step for the V1 to re-home (mostly to get the Z-axis realigned). I'm using Eagle, and have tried the "add via layer" trick. The problem there is that it doesn't recognize that the via is not a contiguous pad. At the very least that causes the Z-probe to dive into the hole when gathering height data and then either jam or otherwise get unhappy. And based on the toolpaths displayed in the software, even if I got as far as dispensing, it looks like it would cover the entire via rather than circling the hole. Would rather not dump paste into the hole if I can help it. If I have to either rebuild this board (having other issues with it) or build another one, I'll take some video. I've already milled another bare board as a just-in-case measure. One other question: if I rebuild the board, I'll probably put the vias in first in order to go stepwise and check out continuity/shorting problems before I have other components on there. But that will cause the bottom of the eyelets to protrude about 1.5mm out the bottom, raising the board up on the bed. That leads to some issues with clamping (tight enough to make it stable, but not so tight as to deform the board or pop any of the vias). Assuming I can solve the clamping issue, is the software going to get cranky if the board is 1.5mm higher than usual? I'd love to hear what you guys think of how the software will react to a Z-probe that discovers a higher-than normal board. Manually pasting/flowing the rivets with higher-temp paste first would simplify the workflow greatly, but only if the resulting lift in the Z-axis doesn't cause other problems. As long as your substrate and clamps have enough clearance for the carriage to pass over in homed position, you will be fine to print and probe. As shown in this (hacky) setup, I've stacked a couple of substrates on top of each other, and placed the clamps on top. 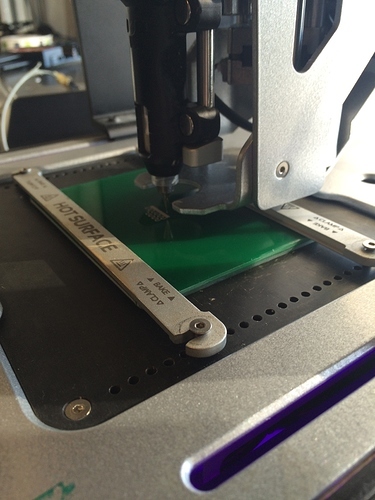 The V-One is able to probe and print with no problems. Thanks much for trying this out. I will in the next week or two be doing a build of the next prototype (two 208 PQFP's on a single board, yay!). I'll let you know how I fare, though it sounds like I shouldn't have an issue. Thanks for pointing out the bottom of the carriage being the limiting factor, I wouldn't haven't thought of that myself until it was too late. I'll also make sure to be taking video during the priming/pasting process to demonstrate the problem if I run into it again. My eight new nozzles arrived, so I'm back out of the danger zone (exhale), and will use a fresh one even if it really isn't necessary. I then tried reflowing on the heated bed but that didn't work so well, which makes sense as the rivets prevent full-surface-area contact with the plate. The board is simple enough that a rework air gun was sufficient. I'm getting better at the hand-soldering, but it is definitely a learned skill and requires much more care than with copper. I'm concerned that even the reflow joints are more delicate than I'd like, but time will tell. The board passes basic continuity checks, which will have to do for now. Thanks again for your responsiveness. Awesome! Do you have any pictures! @jazozaya: here ya go. I used the older-style short connector as that's what I had on hand and didn't need that many GPIO's. I also didn't notice the collision with the "Program" label until the print, and decided not to bother correcting it due to time constraints. My observations are that the hand-soldered joints seem to hold at last partially because they adhere just enough to "drop into" the bevel made by the ring of ink, rather than the traditional cone you see with copper. There's probably adhesion there, it just looks a little dicey to me. The middle LED needed to be reworked a couple of times given how much of a dimple there was on its pads. Also notice I was running a little bit into the reduced-flow-over-time issue that I had with paste, only this time with ink. On the top site, the first traces are the text labels, and they are nice and fat. By the time the ZIF socket pads were being laid down, flow is such an issue that each pad isn't complete. It was good enough for this experiment, but having a contiguous pad would make me feel more comfortable. So - we took a look at your prints... and we have a hunch. Did you end up experimenting with different print heights? If not, the next time you do a print, can you try printing at a height of 0.06 mm by adjusting the value in the settings window? Taking a look at the Power and Program text, it looks like you are depositing way to much ink than what is required as the lines look rather fat. You might be over depositing because your print height may be too high, and are adding ink to make up for it. If you take a look at the vertical line that passes through the m in Program you can see that the line has ripples, this is an indication that the nozzle is too far from the board and ink is being dispensed on the substrate periodically as it builds up on the nozzle. Thicker ink may not cure properly which means burnishing and hand soldering will prove to be very difficult. A high print height combined with excess ink will produce large dimples, which will make attaching components harder. The ink flow will reduce over time since the software assumes you have a lower height. 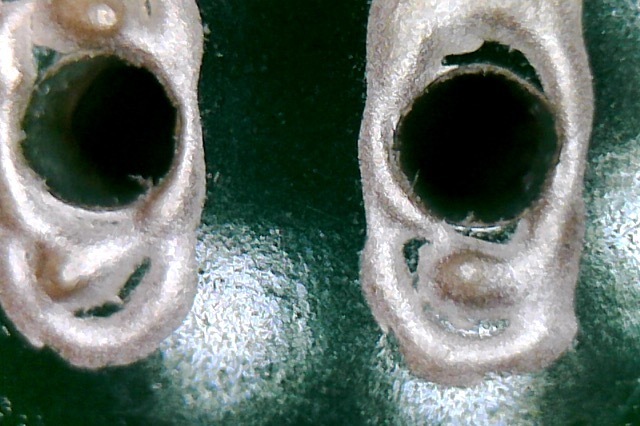 Ink residue in the limit switches - the circular shaft or the gold pad. The dispenser is being removed and remounted after the system does the XY initialization. A wonky probe that somehow got permanently damaged. 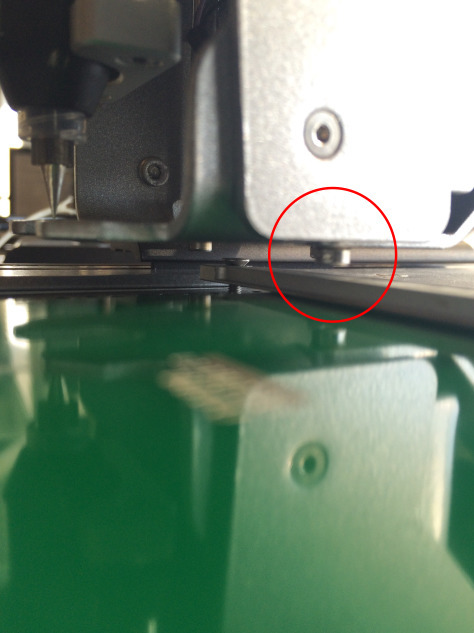 Could you try reducing the height to 0.06 mm and take a picture of a printed calibration pattern? You don't have to cure the ink, wet ink is fine. Just following up - did you get a chance to try what I mentioned above? @jazozaya, no pun intended, but my to-do list is a bit clogged up right now. I do plan on trying out your suggestions however, and will post more pics when I do.